Dessert “Day”? Not long enough. Dessert “Week”? Now, we’re getting closer. Honestly though, we can all agree that desserts deserve their own month. That’s because you can have a totally different treat at the end of every October day and you’ll still have so many left to try. So let’s face the cold sweet facts. Dessert’s a necessity. Why,it’s quite possibly the only reason kids will finish their vegetables. But as an adult, go ahead and have some extra pie. No one’s looking! The largest brownie on record was made by the Something Sweet Bake Shop in Daphne, Alabama. It weighed in at 234 pounds. During the Industrial Revolution in Europe and the U.S., desserts became mass-produced, processed, preserved, canned, and packaged. In his pioneering cookbook "Le Cuisinier François," François Pierre La Varenne declared that sugary foods should be served as the course after savory. Poet Geoffrey Chaucer published the first printed recipe for apple pie. Crystalized sugar made its way via trade routes to Macedonia and China. Go on — give it a try. Make that Baked Alaska, chocolate souffle, or set of eclairs. You'll impress your friends, instill yourself with a sense of pride, and have a delicious reward for your efforts! That's right, skip the eggs. Go for some French toast, Belgian waffles, or chocolate chip pancakes. There's joy in being subversive! How about a costume party where people dress as their favorite dessert? 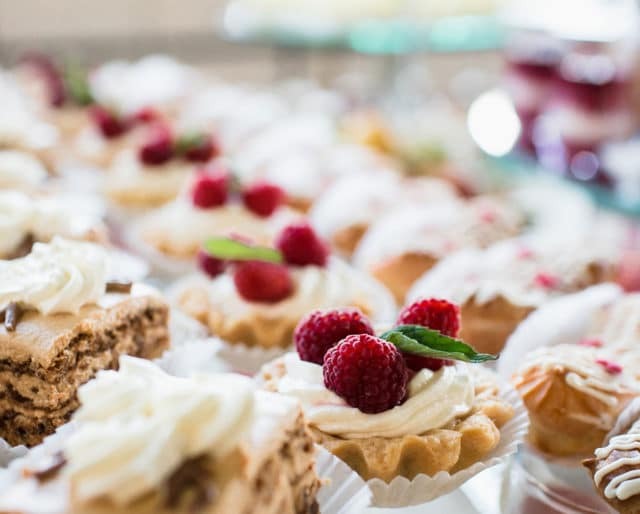 The word "dessert" originated from the French word "desservir," meaning "to clear the table." In the United Kingdom, dessert is usually referred to as "pudding." You read that correctly. The inventor, an Armenian-French chef, likely made the original in a pie tin — more common than cake pans at the time. English was not his first language. You can guess the rest. German chocolate cake was named after Sam German, who developed German’s sweet baking chocolate in 1852. New York's famed Delmonico's Restaurant named this dessert as a way to celebrate Alaska’s annexation. It's sweet. It's delicious. It tops off dinner and you can even have it for breakfast. There's a reason they put whipped cream on waffles. Dessert can help you lose weight. Seriously. Studies have shown that adults who eat dessert as part of an otherwise nutritious diet succeed in losing weight in the long term. Why? Because the body responds to small amounts of desserts by decreasing its own appetite for them. How about a baklava from Greece, a coconut bar from China, or some sherry from France? Or even an exotic fruit salad? It's all out there.